Should China Care About the Future of Its Airpower? There’s little reason for China to concern itself with its air force’s organization structure at this point. Ankit’s recent post (building on Rebecca Grant’s longer list at Air Force Magazine) opens the question of whether China has structured its military institutions such that they support the sophisticated development and dynamic use of military aviation. In short, how does the organizational configuration of Chinese airpower matter for how China will fight, plan to fight, and procure? There is no single optimal way to organize military forces. Different organizational constellations produce different outcomes for warfighting, procurement, and strategic thought. Reorganizations are costly, and shouldn’t be undertaken at the drop of a hat, but nevertheless provide an opportunity to better align organizational imperatives with national goals. In particular, states create independent services and autonomous branches in order to provide political support and protection for certain kinds of capabilities. Independent air forces and navies insulate sailors and airmen from soldiers, and vice versa. In the case of China, there’s a good case to be made that, historically, soldiers have interfered overmuch with the development of aviation and naval forces, generally to bad effect. 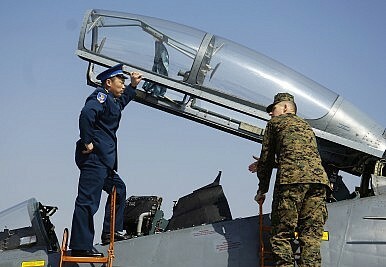 Chinese military aviation, for the first 40 years of the PRC, was justifiably subordinated to the concerns of ground commanders, although those ground commanders in many cases lacked the training, education, and expertise to optimize airpower’s contribution. But then maybe it’s a good thing that the PLAAF remains tied to ground and sea power. For the foreseeable future, the most critical tasks facing Chinese airpower will involve cooperation between the PLAAF, the PLAN, and the Second Artillery. This represents more of a shift in emphasis than an organizational transformation. And this shift in emphasis reflects the fact that the conditions that held in the 1970s have changed. The politico-military old guard that remained from the revolution has long passed, and new generations of Chinese leaders apparently understand the valuable contribution that airpower can make to military effectiveness. There should also be no question that, even within the existing framework, the PLAAF has expanded dramatically in terms of capabilities. This is not the force that failed to project power over Vietnam in 1980. Instead, it is a modern, capable force, operating sophisticated aircraft and capable of developing internationally competitive airframes. The PLAAF isn’t about to adopt strategic bombing doctrine, and likely won’t be starting any fights in the near future with its sister services. Nevertheless, the decision to keep tight reins around the services in China (and the Second Artillery, which is an autonomous branch), makes sense strategically for a country in the PRC’s position. China’s A2/AD system of systems demands tight integration between the different elements of Chinese military power. In this context, the last thing China wants is to allow one organization to “find itself,” and pursue excellence on its own terms. At this point, there is little reason to believe that China’s organizational structure is deficient, or that it requires major reform.